Tri-Lakes Federal Credit Union offers a Visa Debit card that is attached to your checking account. You can use the card in stores where Visa is accepted. Purchases made with your debit card are deducted from your checking account. You can access your savings or checking at the ATM machine with your pin number. There is no fee to order your first debit card. Any replacement cards whether lost, stolen, or damaged will be charged a $15.00 replacement fee. 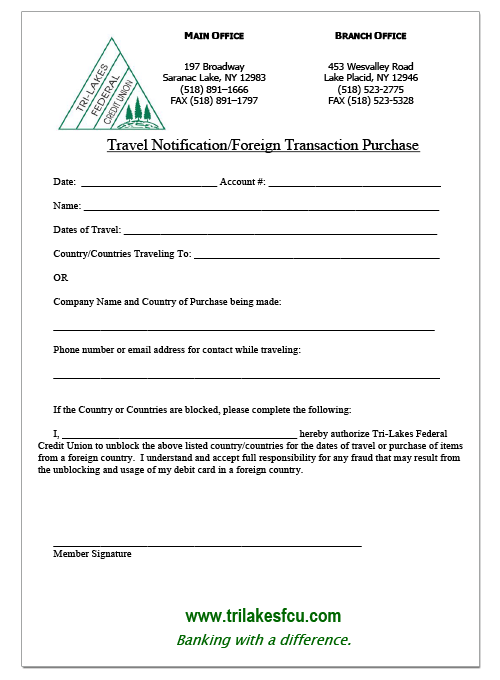 Our debit cards can be used anywhere in the UNITED STATES where VISA is accepted. Your PIN number (Debit) can only be used 3 times in a 24 hour period. Point of Sale (Credit) transactions are limited to 10 in a 24 hour period. These limits are set for your safety and they will reset at 4pm every day. At Tri-Lakes Federal Credit Union, protecting your accounts is our top priority. Our fraud detection system looks for transactions out of your normal spending pattern or unusual locations that your card may be used. Our fraud detection center may contact you to verify this information. It is important that you respond to their call. And it is also very important to make sure that we have the most up to date contact information on file for you. With the large amount of debit card fraud occurring lately, we have compiled the following information to help you prevent debit card fraud and assist if your account is compromised. Keep your PIN secret. Never write it down, and never tell anyone what it is. Try to never let your card out of your sight. Do not use your debit card for online purchases. Because your debit card is linked to your personal checking account you are opening up your full account balance to potentially be stolen. Debit cards do not have the same protection as Credit cards. Always use a Credit Card for these types of purchases. Because of fraud, and the potential for your card to be blocked, always be sure to have multiple payment types available to you, whether it’s another debit card, a credit card or cash. To Report a Lost or Stolen card during business hours please call (518) 891-1666. After business hours or on the weekends please call (800) 472-3272. If you receive a phone call from our Fraud Detection Center please listen to the message they leave you. They will leave you a case number that you will need to provide when calling them back. The telephone number for Fraud Detection is (800) 262-2024. If you do not have the case number please hit 0 until you reach an operator.